Exquisite design and exceptional craftsmanship are brought together in this unusual White Gold Necklace. 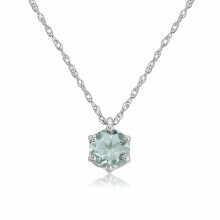 A pale blue Aquamarine sits in the centre of a Diamond-set hexagon, with further Diamonds on the Pendant’s bail. This piece makes a very special gift, particularly for birthdays as Aquamarine is the birthstone for the month of March.